I was indeed blind lol and had my page scrolled down too far. Flanders wrote: Guarantee most of these have never been seen here. Turkish Jockey Club stallion directory with conformation shots of all. A lot of those confo photos are baaaad. Nobody looks really skinny (except for some of the horses fresh off the track), just poorly muscled, woolly/dirty, and posed badly. TJK photos used to look a lot better overall, I wonder if the rough political situation is getting to them. Deha, Halicarnassus, Native Khan, Victory Gallop, and Yildirimbey still look lovely though. The quality of the stallions themselves and their pedigrees is still excellent though. IIRC they don't race geldings in Turkey so the homebred stallions often have long careers behind them. And it's nice to see stallions from diverse sirelines like Unaccounted For, Sea Hero, Pleasantly Perfect, Divine Light, Yonaguska, Red Bishop and Strike The Gold become influential sires in the breed over there. Arrowfield Stud in Australia has added 360 view of their stallions and you can also view them walking.I wouldn't be surprised if more studs do this. 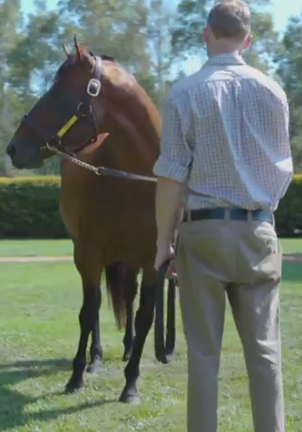 Sunline wrote: Arrowfield Stud in Australia has added 360 view of their stallions and you can also view them walking.I wouldn't be surprised if more studs do this. Maurice is beautiful! Loved him sticking his tongue out in the 360 view though! And yes it would be neat if more studs did this. LOL Snitzel totally looks like he's leaning when the camera pans around for the head-on angle... it must be something kind of warped about the way it films, b/c the others also look a bit odd as the camera moves from full-on toward the left, but Snitzel's is by far the most noticeable. I love the 360 view! I am sure everybody understands that these are live creatures that shift weight around and move so when they are being walked around movement is going to happen. It still gives a wonderful view of what the stallions look like at all degrees. I like how you can pause and rewind the walking videos too by just dragging your mouse left or right. Excellent! CoronadosQuest wrote: I am sure everybody understands that these are live creatures that shift weight around and move so when they are being walked around movement is going to happen. LM, that whole post made me laugh out loud. It was the "...because this," followed by that photo.